I'm sure most of you are familiar with The Random Stripe Generator. And of course, Fibonacci sequences for creating stripe patterns. Another idea came from my friend Ruth, whom I met through the Blue Ridge Spinners. Ruth sometimes uses barcodes for stripe patterns. She's used barcodes right off of products, such as peanut butter and jelly, but I thought perhaps I could find an online barcode generator and create my own barcodes. Free Barcoding Generator by Barcoding Incorporated. I could create a Catzee sweater, or blanket, or vest, or anything striped. When I signed up for my area guild's towel exchange, I decided on both waffle weave and stripes. For my stripes, I wanted to try this barcode idea. My first idea was, that since the exchange was going to be in November, to go with a holiday theme. So I got the barcode for "Merry Christmas." The red and green are the stripes in the barcode. However, after washing and measuring, the stripe pattern did prove to be too long for the width towels I need to weave. I've been able to work this out to the required width (after shrinkage!). I'm using 10/2s cotton, alternating blue and green for the stripes, with unbleached natural. So far the warp is wound on to the back beam and is ready for heddle threading. I plan to get started on that tomorrow. Thanks for the link to the bar code generator. I would not have thought to do that. My previous experience with randoom stripes involved me using an Excel spreadsheet and some basic probability/statistics. What a fun idea! I have used the stripe generator in the past, this is perfect for word weaving as in Bonnie Tarses! I'm delighted to see another way of creating meaningful coded stripes. Brava! So fun! I just tried my name, and saved the result in .bmp. I will try and weave it some day. :). Thanks for showing this to us. What fun!!!! You find the greatest things on the internet. Thanks for sharing. So far I've done the names of all the folks and critters at our house -- and a few &*^% phrases! What fun! Did you come up with a slick way to translate the width of the stripes to your warp? 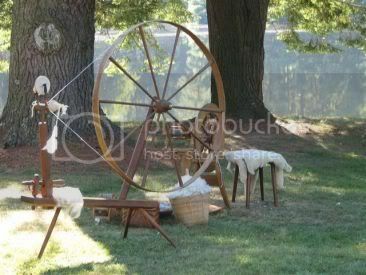 That looks very fun can't wait to get a loom!!! I have been doing random stripes for a couple of years now, but occasionally they don't look so random. This is definately fun to play with! It's great Leigh. I'm just missing how to translate the barcode into a warp. How do you calculate the width of the bars to number of dents? Leigh, 2 sweets out of the jar for you! (as my mother used to say) What a great fun way to plan a project. I'm delighted that you all found the barcode generator fun and useful. Several of you are asking about how to apply it to a warp, so tomorrow I'll publish a post on how I did that. I was just going to say what fun.. I see lots of other people have got there before me! I generally like stripes, something about them is kind of cheerful. Do you think you might weave a Catzee blanket? I wonder if she'd blend in to it if she curled up for a nap, the way my tabby cat Phoebe does on a wool blanket I have - I didn't realise it was a tabby blanket until I saw her sitting on it! you are too creative for just one person... you need to be cloned!! bravo! I love the barcode idea! Although I don't really understand what you are doing, I realize it is extremely cool and seems to dovetail with Woven Words. I am just getting back to town and have much to catch up on, but I will have to come back and study this some more.